The axon executioner SARM1 is an enzyme and therefore potentially druggable according to a new study. The study, led by Washington University St Louis’ Jeffrey Milbrandt in Missouri, found that SARM1 catalyzed the cleavage of NAD+, a key cofactor needed for ATP synthesis (Essuman et al., 2017). 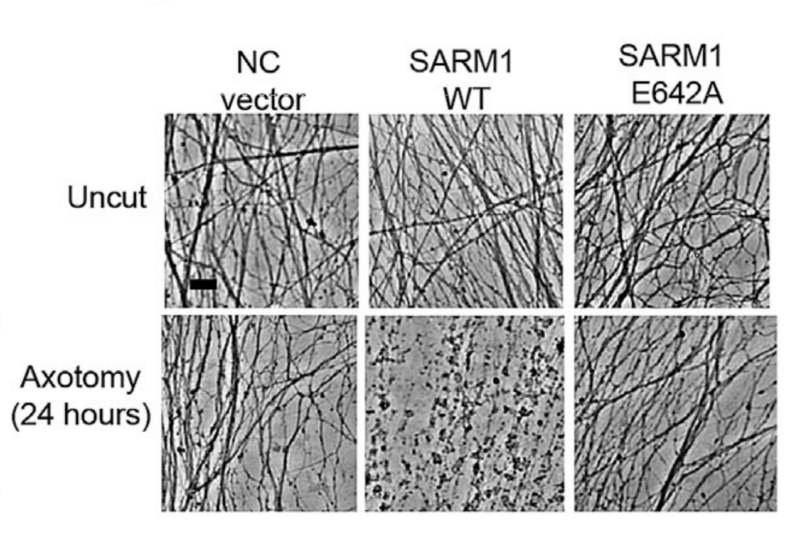 Milbrandt’s team previously demonstrated that SARM1 triggered axon degeneration by depleting its energy by reducing the availability of NAD+ (see April 2015 news; Gerdts et al., 2015). The findings build on studies in 2012 led by Marc Freeman at the University of Massachusetts Medical School in Worcester which found that injured axons self destruct through a SARM1-mediated mechanism (see June 2012 news; Osterloh et al., 2012). The study is published on March 16 in Neuron. Researchers discovered in 2014 that SARM1 may play a role to ALS by performing genome-wide association studies (GWAS) of sporadic disease. The study, led by Istituto Auxologico Italiano’s Vincenzo Silani in Italy, found that variants in the SARM1 gene significantly associated with the disease (P = 1.11 × 10(-8); OR 0.82) (Fogh et al., 2014). Subsequent GWAS analysis led by King’s College London’s Ammar Al-Chalabi in England, UMC Utrecht’s Jan Veldink and Leonard van den Berg in the Netherlands confirmed these conclusions (van Rheenan et al. 2016). Meanwhile, J. Alex Parker’s team at the University of Montreal Hospital Research Center in Canada turned to C. elegans to determine whether SARM1 may contribute to axonal loss in ALS, which may occur before the first signs of the disease (see Fischer and Glass, 2007). The study, published in 2015, found that SARM1 mediated the degeneration of motor neurons in a TDP-43 and a FUS model of ALS (see June 2015 news; Vérièpe et al., 2015). The findings add to previous observations from the University of Massachusetts Medical School’s Robert Brown and Marc Freeman presented at the 2013 Drosophila Research Conference in Washington, D.C, which indicated that SARM1 may contribute to the destruction of at least 50% of motor neurons in a SOD1 model of the disease (see April 2013 news). Together, the results suggest that sARM1 may contribute to ALS and therefore may be a potential target in the disease. Essuman K, Summers DW, Sasaki Y, Mao X, DiAntonio A, Milbrandt J. The SARM1 Toll/Interleukin-1 Receptor Domain Possesses Intrinsic NAD+ Cleavage Activity that Promotes Pathological Axonal Degeneration. Neuron. 2017 Mar 22;93(6):1334-1343.e5. [PubMed] . Gerdts J, Brace EJ, Sasaki Y, DiAntonio A, Milbrandt J. SARM1 activation triggers axon degeneration locally via NAD⁺ destruction. Science. 2015 Apr 24;348(6233):453-7. [PubMed]. Yang J, Wu Z, Renier N, Simon DJ, Uryu K, Park DS, Greer PA, Tournier C, Davis RJ, Tessier-Lavigne M. Pathological axonal death through a MAPK cascade that triggers a local energy deficit. Cell. 2015 Jan 15;160(1-2):161-76. [PubMed]. Osterloh JM, Yang J, Rooney TM, Fox AN, Adalbert R, Powell EH, Sheehan AE, Avery MA, Hackett R, Logan MA, MacDonald JM, Ziegenfuss JS, Milde S, Hou YJ, Nathan C, Ding A, Brown RH Jr, Conforti L, Coleman M, Tessier-Lavigne M, Züchner S, Freeman MR. dSarm/Sarm1 is required for activation of an injury-induced axon death pathway. Science. 2012 Jul 27;337(6093):481-4. [PubMed]. Vérièpe J, Fossouo L, Parker JA. Neurodegeneration in C. elegans models of ALS requires TIR-1/Sarm1 immune pathway activation in neurons. Nat Commun. 2015 Jun 10;6:7319. [PubMed]. Fogh I, Ratti A, Gellera C, Lin K, Tiloca C, Moskvina V, Corrado L, Sorarù G, Cereda C, Corti S, Gentilini D, Calini D, Castellotti B, Mazzini L, Querin G, Gagliardi S, Del Bo R, Conforti FL, Siciliano G, Inghilleri M, Saccà F, Bongioanni P, Penco S, Corbo M, Sorbi S, Filosto M, Ferlini A, Di Blasio AM, Signorini S, Shatunov A, Jones A, Shaw PJ, Morrison KE, Farmer AE, Van Damme P, Robberecht W, Chiò A, Traynor BJ, Sendtner M, Melki J, Meininger V, Hardiman O, Andersen PM, Leigh NP, Glass JD, Overste D, Diekstra FP, Veldink JH, van Es MA, Shaw CE, Weale ME, Lewis CM, Williams J, Brown RH, Landers JE, Ticozzi N, Ceroni M, Pegoraro E, Comi GP, D’Alfonso S, van den Berg LH, Taroni F, Al-Chalabi A, Powell J, Silani V; SLAGEN Consortium and Collaborators. A genome-wide association meta-analysis identifies a novel locus at 17q11.2 associated with sporadic amyotrophic lateral sclerosis. Hum Mol Genet. 2014 Apr 15;23(8):2220-31. [PubMed]. van Rheenen W, Shatunov A, Dekker AM, McLaughlin RL, Diekstra FP, Pulit SL, van der Spek RA, Võsa U, de Jong S, Robinson MR, Yang J, Fogh I, van Doormaal PT, Tazelaar GH, Koppers M, Blokhuis AM, Sproviero W, Jones AR, Kenna KP, van Eijk KR, Harschnitz O, Schellevis RD, Brands WJ, Medic J, Menelaou A, Vajda A, Ticozzi N, Lin K, Rogelj B, Vrabec K, Ravnik-Glavač M, Koritnik B, Zidar J, Leonardis L, Grošelj LD, Millecamps S, Salachas F, Meininger V, de Carvalho M, Pinto S, Mora JS, Rojas-García R, Polak M, Chandran S, Colville S, Swingler R, Morrison KE, Shaw PJ, Hardy J, Orrell RW, Pittman A, Sidle K, Fratta P, Malaspina A, Topp S, Petri S, Abdulla S, Drepper C, Sendtner M, Meyer T, Ophoff RA, Staats KA, Wiedau-Pazos M, Lomen-Hoerth C, Van Deerlin VM, Trojanowski JQ, Elman L, McCluskey L, Basak AN, Tunca C, Hamzeiy H, Parman Y, Meitinger T, Lichtner P, Radivojkov-Blagojevic M, Andres CR, Maurel C, Bensimon G, Landwehrmeyer B, Brice A, Payan CA, Saker-Delye S, Dürr A, Wood NW, Tittmann L, Lieb W, Franke A, Rietschel M, Cichon S, Nöthen MM, Amouyel P, Tzourio C, Dartigues JF, Uitterlinden AG, Rivadeneira F, Estrada K, Hofman A, Curtis C, Blauw HM, van der Kooi AJ, de Visser M, Goris A, Weber M, Shaw CE, Smith BN, Pansarasa O, Cereda C, Del Bo R, Comi GP, D’Alfonso S, Bertolin C, Sorarù G, Mazzini L, Pensato V, Gellera C, Tiloca C, Ratti A, Calvo A, Moglia C, Brunetti M, Arcuti S, Capozzo R, Zecca C, Lunetta C, Penco S, Riva N, Padovani A, Filosto M, Muller B, Stuit RJ; PARALS Registry. ; SLALOM Group. ; SLAP Registry. ; FALS Sequencing Consortium. ; SLAGEN Consortium. ; NNIPPS Study Group., Blair I, Zhang K, McCann EP, Fifita JA, Nicholson GA, Rowe DB, Pamphlett R, Kiernan MC, Grosskreutz J, Witte OW, Ringer T, Prell T, Stubendorff B, Kurth I, Hübner CA, Leigh PN, Casale F, Chio A, Beghi E, Pupillo E, Tortelli R, Logroscino G, Powell J, Ludolph AC, Weishaupt JH, Robberecht W, Van Damme P, Franke L, Pers TH, Brown RH, Glass JD, Landers JE, Hardiman O, Andersen PM, Corcia P, Vourc’h P, Silani V, Wray NR, Visscher PM, de Bakker PI, van Es MA, Pasterkamp RJ, Lewis CM, Breen G, Al-Chalabi A, van den Berg LH, Veldink JH. Genome-wide association analyses identify new risk variants and the genetic architecture of amyotrophic lateral sclerosis. Nat Genet. 2016 Sep;48(9):1043-8. [PubMed]. 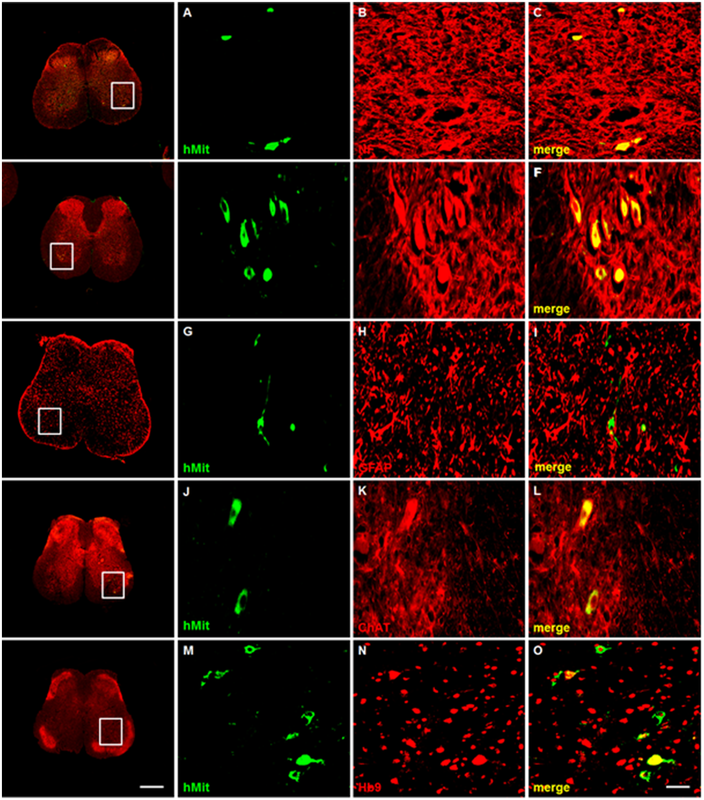 Image on the home page: SARM1-mediated degeneration of mouse axons. Josiah Gerdts, while in the Milbrandt lab. Courtesy of Washington University St-Louis.